Fig. 101. Detail of Knee-Brace and Connections. 25. Runway Girders. The runway girders extend from column to column on each side of the bay in which the girder runs. An inspection of the figures of this article will give a clear idea of their position and their details. Along these girders run the wheels which support the end of the crane. 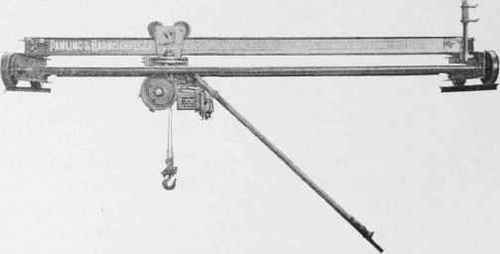 The crane may be a small hoist, as indicated in Figs. 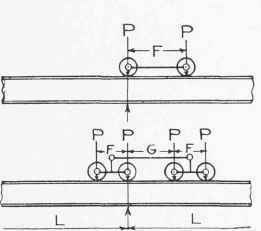 102, 103, and 104, in which case the crane girder consists of a simple I-beam supported by two wheels at the ends, and these are placed close together. 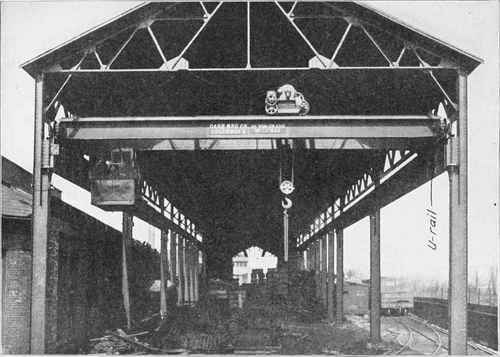 In other cases the crane consists of two girders placed side by side, upon which runs the carriage carrying the hoist. 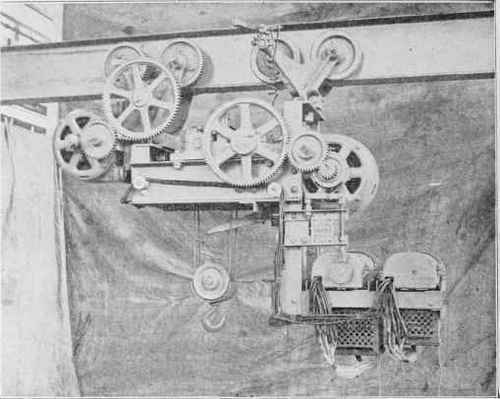 This type of crane is supported upon four to eight wheels (see Figs. 105, 106, 107, 108, 109, and 110). Fig. 102. Electric I-Beam Hoist, One-Motor. Courtesy of Case Manufacturing Company, Columbus, Ohio. Fig. 103. 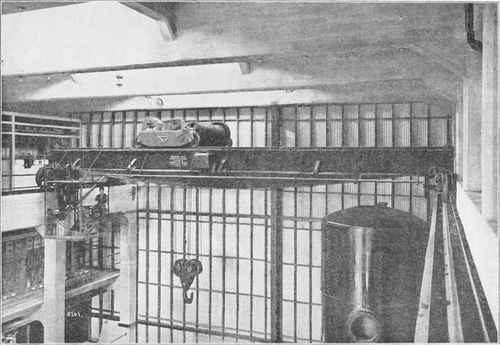 Electric I-Beam Hoist. Courtesy of Maris Brothers, Philadelphia, Pennsylvania. The maximum bending moment and shear in a runway girder will depend upon the capacity and span of the crane, and also upon the distance apart of the wheels at its ends. 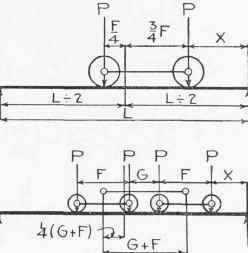 Where the bending moment is not too great, the runway girders may be composed of channels or I-beams (see Figs. 103, 104, and 106). In case the moment is too great to make the use of these possible, the runway girders are composed of plate-girders (see Figs. 105, 107 to 110). Fig. 104. Small Electric I-Beam Hoist; Capacity 500 Lbs. Courtesy of Pawling & Harnischfeger, Milwaukee, Wis. Fig. 105. 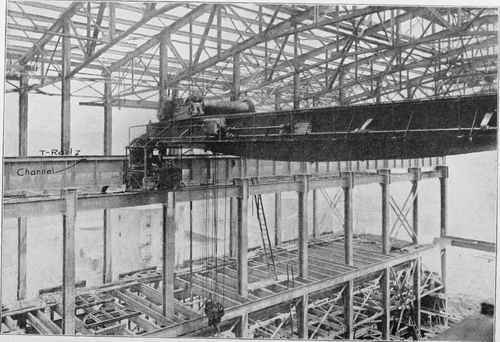 Ten-Ton Three-Motor Electric Traveling Crane. Courtesy of Case Manufacturing Company, Columbus, Ohio. Fig. 106. 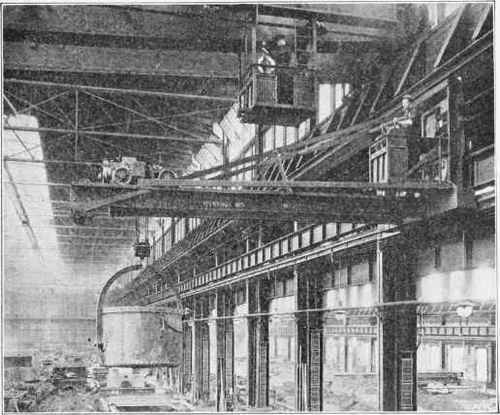 Five-Ton Three-Motor Electric Traveling Crane, Operated from Floor. Courtesy of Case Manufacturing Company, Columbus, Ohio. Fig. 107. 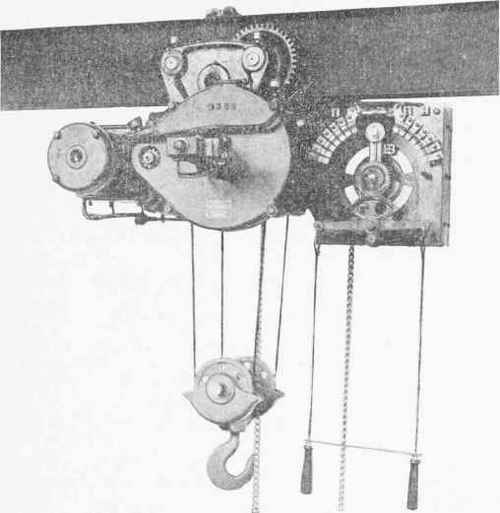 Fifty-Ton Three-Motor Electric Traveling Crane. Courtesy of Northern Engineering Works, Detroit, Mich. Fig. 108. Fifty-Ton Four-Motor Electric Traveling Crane. 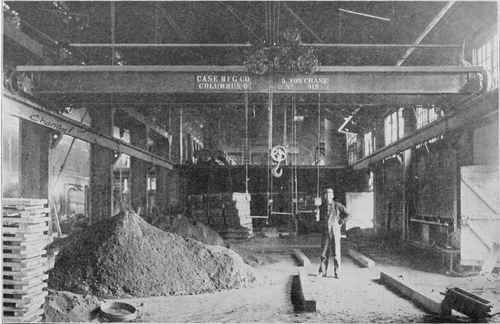 Courtesy of Northern Engineering Works, Detroit, Mich. Fig. 109. Wall Jib-Crane, Electrically Operated; Capacity, 10,000 Lbs. Courtesy of Pawling & Harnischfeger, Milwaukee, Wisconsin. Plate-girders consist of a flat plate called a web plate, which has riveted to it at its upper and lower edges two angles, or two angles and one plate, called the cover-plate. The angles are called flange angles; and the two angles together, and the cover-plate when used, are called the flanges. At certain distances along its length, equal to or less than its depth, vertical angles are riveted on opposite sides of the web plate. 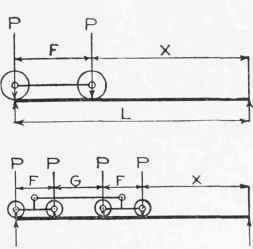 These are called stiffeners, their function being to stiffen the web under the action of the shear. See Fig. 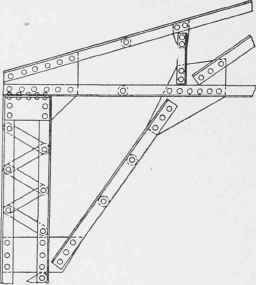 Ill for a general view of a plate-girder, together with the names of the various parts. Fig. 110. 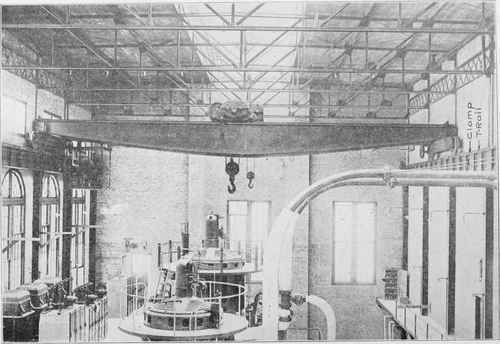 Thirty-Ton Four-Motor Electric Traveling Crane in Power Station. Courtesy of Northern Engineering Works, Detroit, Mich.
ALPHA DELTA PHI CHAPTER-HOUSE AT CORNELL UNIVERSITY, ITHACA, N. Y. Dean & Dean, Architects, Chicago, 111. ALPHA DELTA PHI HOUSE AT CORNELL UNIVERSITY. ITHACA. GEORGE R. DEAN ARCHITECT. 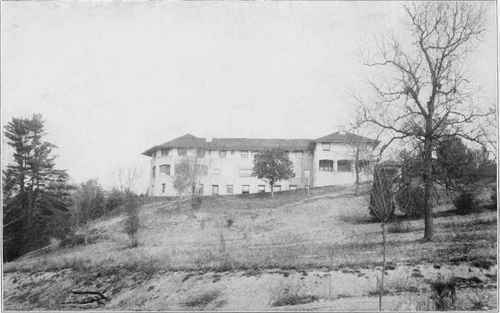 PLANS OF ALPHA DELTA PHI CHAPTER-HOUSE AT CORNELL UNIVERSITY, ITHACA, N. Y. Dean & Dean, Architects, Chicago, 111. Exterior Shown on Opposite Page. Fig. 112. Position of Crane Truck for Maximum End Shear of Runway Girder. Fig. 113. Position of Crane Truck for Maximum Moment in Runway Girder.